The Cryo tunnel - CFP is a tunnel allowing complete crust-freezing of fragile and soft foods, etc. The products are placed on a conveyor belt saturated with liquid nitrogen which has the effect of instantly freezing the product base. Depending on the equipment configuration, the product can be immersed in a liquid nitrogen bath or frozen in the conventional way by a spray of liquid nitrogen. 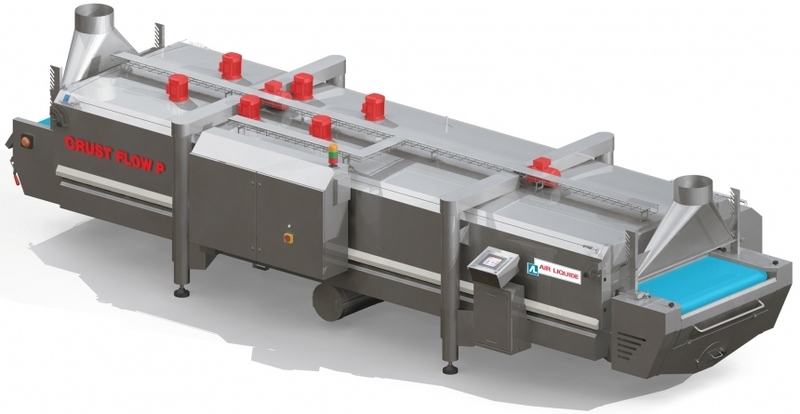 The quick process ensures that the shape and appearance of food is preserved (extruded biscuits, pasta, mousses, ready meals, ice cream). Other complex products (e.g. ice creams) need to be crust-frozen before coating with a coulis, topping or chocolate. This application eliminates manufacturing defects (deformation, marking and sticking).